I first wrote about PhraseExpress in 2009. 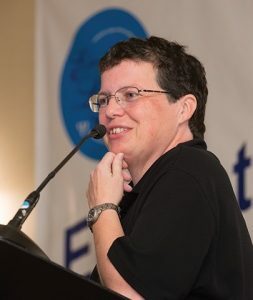 My new policy: if I’m still using a particular technology 10 years later, it deserves a new blog post. PhraseExpress is a text expander (and more) for Windows, Mac, Android, and iPhone. The reviews for the mobile versions are mixed, so I’m going to limit the post to Windows. (Mac functionality is similar, I just don’t have a Mac.) PhraseExpress is free for non-commercial use. The pay-for upgrades give you more functionality that may or may not be useful to you. They’re a one-time fee – not annual subscription – for that version. For significant version upgrades which do not happen often, you’ll need to purchase again, but you’ll get a discount as a current pay-for user. Personally, I pay for the “Standard” version not because I need the features, but because I want to support the developers who maintain I product I use daily. Hourly. It works at the level of the operating system. If you can type, it will work. Email. Word processing programs. Your web browser – and, yes, that includes your course management system. A text expander, like PhraseExpress, allows you to create keyboard shortcuts for longer phrases. 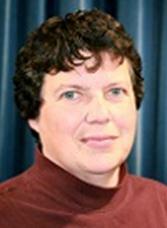 I have an assignment where my students write about internal and external locus of control. As I score their assignments, I don’t want to type those words over and over again. I created two PhraseExpress shortcuts. When I type iloc, it expands to internal locus of control. When I type eloc, it expands to external locus of control. I have another assignment on the Big Five personality traits. I don’t want to repeatedly type any of the Big Five, but especially conscientiousness. I created five PhraseExpress shortcuts. Bfc, for example, expands into conscientiousness. I bet you can guess what I use for agreeableness, openness, extraversion, and neuroticism. I don’t type out my work email address any more. I just type @h and it expands to sfrantz@highline.edu. I’m glad you’re interested in taking General Psychology! Please go to the Psyc& 100 entry in the class schedule and log in with your Highline username and password. Right above the description for the course in tiny print there is a link to “request an entry code.” Click on the link and follow the instructions. Be sure to include whatever documentation you have that shows that you meet the prerequisites for the course. For single words, I tend to use a few letters. For sentences and paragraph, I tend to use a word preceded by either # or !. It’s a personalized system. Use whatever makes sense for you. After installing and running PhraseExpress, it will always run in the background. 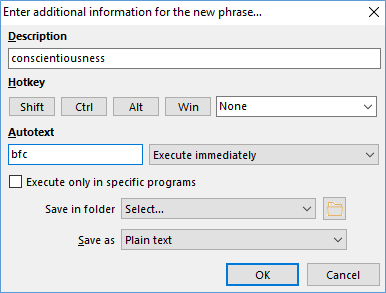 Type the word or words you want associated with a shortcut, like conscientiousness. Highlight it, and copy it. In your system tray (icons in the bottom left of your screen), left-click on the Phrase Express icon. 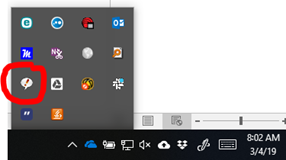 If you don’t see it, click the up arrow at the left end of the list of icons to see everything in your system tray. In the pop-up menu, you will see the last 20 things you’ve copied. Bonus: PhraseExpress expands your clipboard from Window’s one item to twenty items. Although, as of this writing, some of you have the new Windows version (Build 1809) that comes with a much-improved clipboard manager. At the bottom of the menu, click on “New phrase…” In the pop-up window, you’ll see whatever you copied last in the “Description” box. PhraseExpress will make the description and the content of your phrase the same. You can change the description into something else. PhraseExpress is searchable, so you may want to add certain search terms here just to make it easier for you to find later. (I don’t bother to change it.) Next, what will your shortcut be? You can choose to hold down, for example, the “Alt” key when you type your shortcut. I generally don’t use these hotkeys. Again, whatever works for you. For short phrases, I just enter in the Autotext box letter combinations I’m unlikely to type but am likely to remember. In this case, bfc for conscientiousness. Click OK.
PhraseExpress will confirm that it has saved your shortcut. And if that’s all you use it for, learning this much will absolutely have been worth your time. 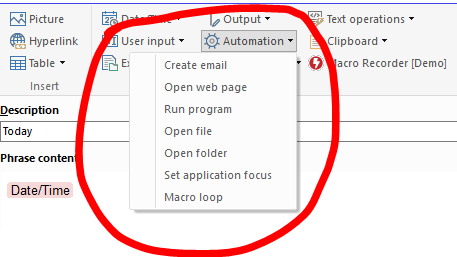 Right-click on the system tray icon, select “Open Program Window,” select the “Phrases” tab, and click the “New Phrase” icon in the top left corner. Then click anywhere in the “Phrase Content” box on the right. Instead of using “copy” to create a new phrase, you can create one this way, instead. But that’s not what I want to show you. You have an entire menu of options at the top of the window that will allow you to do a number of very powerful things. As an example, click on “Date/Time,” and select “Date/Time” from the dropdown menu. 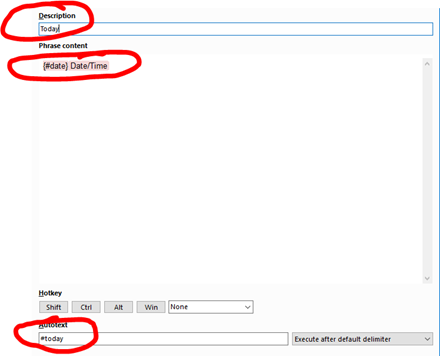 In the pop-up window, use the “Presets” list to choose a date/time format. 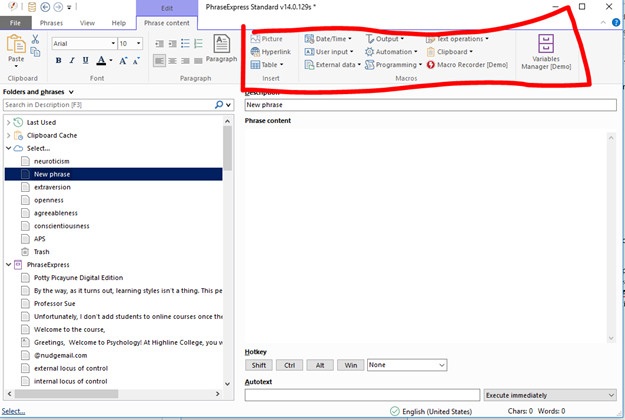 PhraseExpress will add some code to the “Format” box. Click the OK button. This will take you back to the previous “create new phrase” window. Add a description. What PhraseExpress automatically added will be highlighted in pink. In the AutoText box, type your keyboard shortcut, like #today. Since PhraseExpress autosaves, you can just close the window. 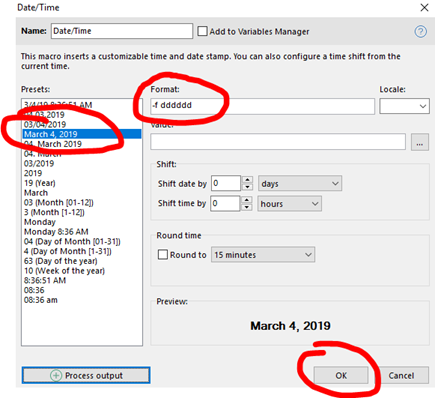 Now when you type your autotext, in this case #today, it expands to the date format you chose (month day, year): March 4, 2019. Explore the other functions, like “Automation.” You can create a shortcut that no matter where you type it, for example, it would open a file or a folder or a webpage or a program. Right-click on the PhraseExpress icon in your system tray. Click on “Open Program Window.” In the “Folders and phrases” pane, search using a word in the description, a word in the phrase content, or your keyboard shortcut for the item you want. Click on it. Edit what you want. Close the window. Done! Start with a few phrases. As you get used to using your shortcuts, expand your repertoire. For my most commonly used phrases, I don’t even think about them as shortcuts anymore — @h is my email address. Thanks for asking, because that made this post a little tricky to write. I had to type @.h first, and then go back and delete the period.